We had Mikail's therapy appointment this week again. Our physiotherapist was on holidays so it was just O.T. and Speech and Language. 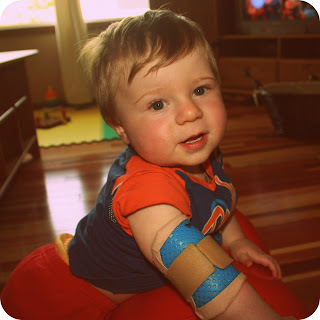 The majority of the hour we spent together was having a custom arm brace made for Mikail. You see he is still army crawling, which is fine. Many kids army crawl and then get up and run. With Mikail, we do know that he is army crawling because his right arm is too weak to hold up his body, so we have spent this past month strengthening it with a therapy ball. It has been so great. He is now crawling 5+ "steps" before he decides it is too slow and gets down and army crawls again. He is so super fast on his belly that we think he thinks 'why take the slow road when it can be done faster a different way'? Since the therapy ball has helped a lot, we are going the next step. Our O.T. made a custom brace for his right arm so that when it is on, he cannot bend his right elbow which will hopefully force him to crawl since he can't army scoot using that side. It works!! Well, that is, when he is not stubbornly mad and crying and yelling because he has this uncomfortable thing on his arm keeping him from doing what he wants to do. 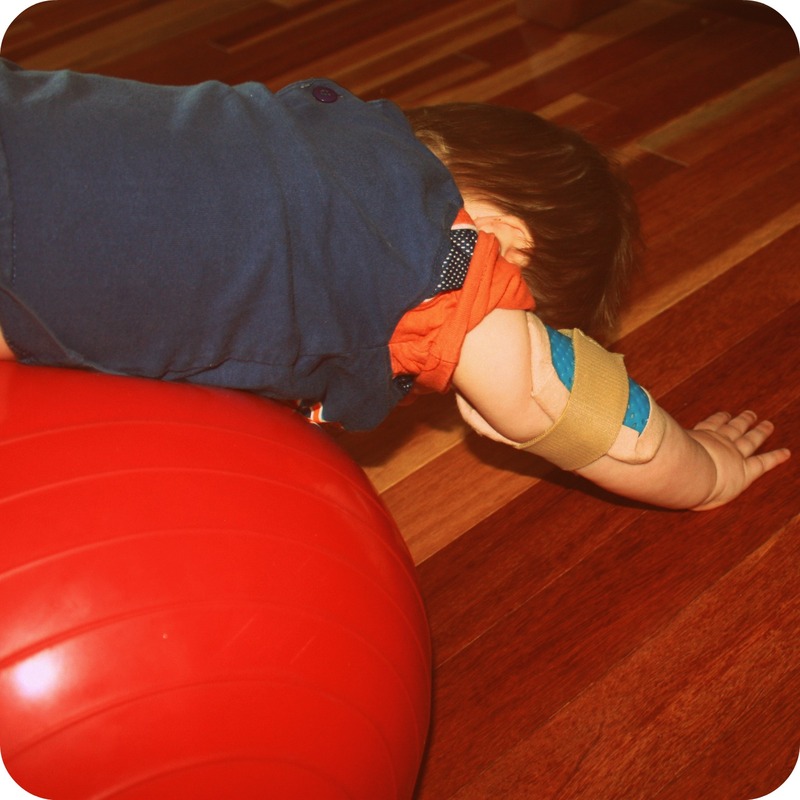 Once he forgets about it and has had his little fit, he is good to go and crawls. The real crawl. Not the army crawl. We are really pushing him to do these motor skills because we still have a window of 11 months where his brain is still able to heal and create new pathways where there were damaged ones before. So, we are really wanting to take advantage of this 'elastic time' of his brain so we don't miss out on anything. These pictures aren't the greatest angles, because I was trying to 'spot' for him while he did his exercises but taking pictures at the same time.